Replacement cowling for a GWS Pico Cub F. Useful for many other scale projects. 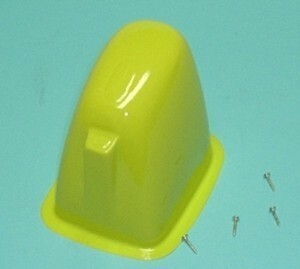 Vacumme formed yellow plastic. When trimmed, nose to back edge over all length 2.75" (70mm). 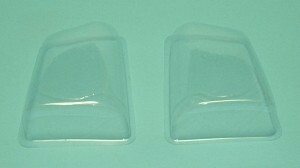 Made to fit generally retangular fuse about 2.2" (56mm) wide, and up to 2.95" (75mm) high. Nose has trimming indentations for prop shaft exit near top of face aproximately .725" (18.4mm) ID. Similarly an indentation for trimming in a Cub-like cooling hole is below the prop hole. Front of cowling about 1.4" (38mm) wide. Many earlier kits intended for stick mounts were made for gearbox motors. If you use an outrunner in one of these models, the motor shaft will exit cowling in the wrong spot looking silly and probably flying poorly. Outrunners require the stick to be further offset from the intend motor shaft location. This mount system allows you to offset the stick to either side of the typical crop of park flyer sized 28mm series motors. I oiriginally designed this part so we could get an outrunner into a GWS Tiger Moth 400 without doing surgery on the foam fuse. In this case, I'm offsetting the motor stick below the motor. Optional side plates are provided so that you can get the shaft on either side of the original motor stick location. Also, the side plates have oval holes so you can make adjustments to motor thrust line and adjustment to cowling exit location for the shaft on one dimension. Sounds complex, but it's really just 4 simple parts bolted together. Comes with drawing and instructions. Great way to update older designed molded foam kits.